Establish and demonstrate that continuity activities contribute value to a company's day to day operations. We do BC, DR and CM every day. We complete everything on time and within budget. We make it easy and fun for the business units to work with us. We build plans. We test plans. We train people. We empower people. But when do we measure our results? How can we measure the results? How can I create a substantially defensible measurement system that accurately conveys the value our continuity efforts are contributing to the company’s day to day operations? AND the progress we are making towards a more resilient organization? Every executive needs to know what the company gains by any investment they make. 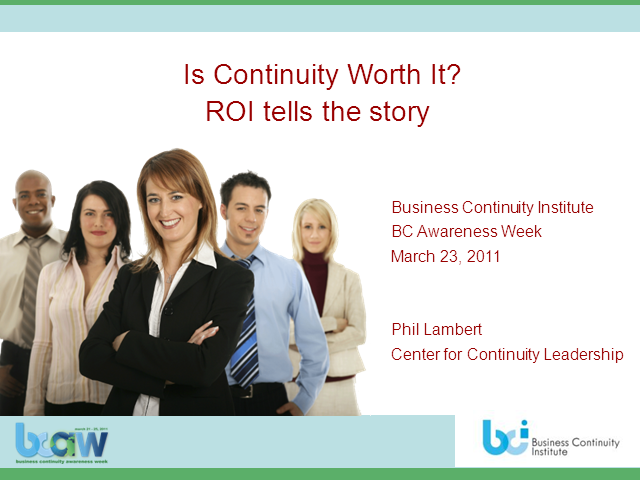 And one of the hardest investments to evaluate is the business continuity program. If there is a way to prove that there is indeed a return on their investment, how much more significant would our program be? Phil will explore the possibilities about whether there actually is a return on investment when investing time, energy and money in a continuity program. -how to continually justify the company’s investment in continuity efforts.